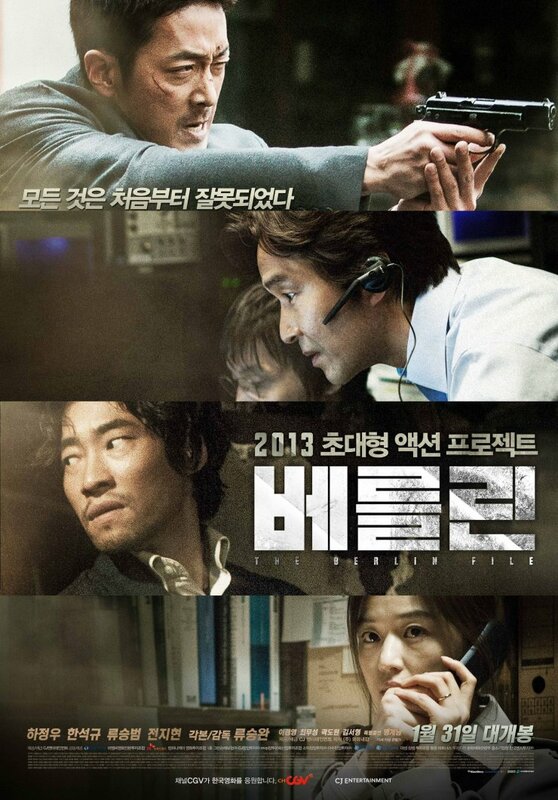 The hype generated for writer/director Ryoo Seung-wan’s (류승완) latest action-thriller The Berlin File (베를린) has been fierce. Boasting a stellar line-up of acting talent, and with the director’s last film The Unjust (부당거래) proving popular with audiences and critics alike, curiosity has been fervent as to whether director Ryoo could take his trademark mix of multiple narratives and high-octane action to the next level. The Berlin File features a genuine evolution in director Ryoo’s style, with some of the most adrenaline-inducing action sequences in recent memory and a huge leap up from his prior films. Yet as with his past filmography, The Berlin File is also stunted by far too many protagonists and a highly convoluted narrative, while his preoccupation with male characters relegates Jeon Ji-hyeon (전지현) to the sidelines. However, the director must be congratulated for the scale of the film, not only for filming in a foreign country with the inclusion of several languages, but also for featuring a North Korean spy as the hero of the film. 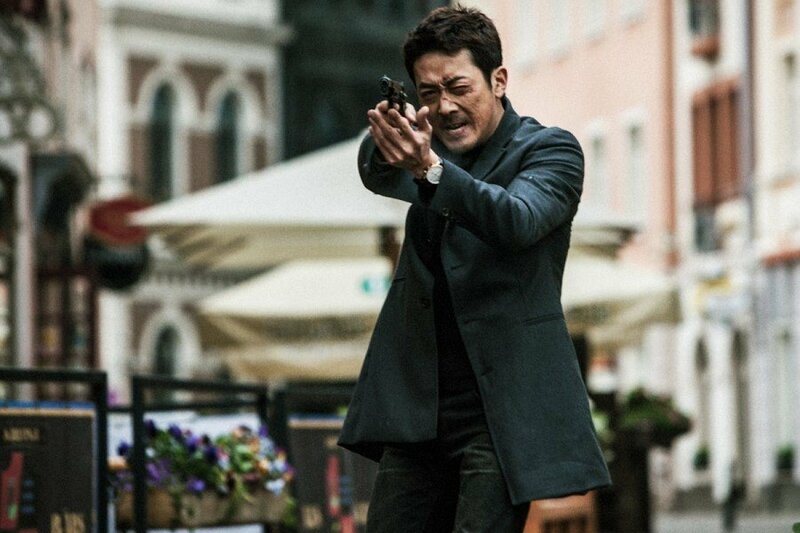 After a weapons deal in Berlin goes wrong, top North Korean agent Pyo Jong-seong (Ha Jeong-woo (하정우) attempts to flee the scene. Unbeknownst to him however are the South Korean agents on his tail, led by Jeong Jin-soo (Han Seok-Kyu (한석규). As the two men clash Jong-seong manages to escape back to his safe house and wife Ryeon Jeong-hee (Jeon Ji-hyeon (전지현), who works as a translator – and ‘entertainer’ – at the North Korean consulate. With the new Kim Jong-un government establishing themselves, suspicions arise that a traitor exists in the Berlin offices. Dispatching ruthless North Korean agent Dong Myeong-soo (Ryoo Seung-beom (류승범) to find the mole, all the evidence seemingly points to Jeong-hee. Yet Jong-seong and Myeong-soo come into conflict, tensions reach breaking point when the CIA, Mossad, Arabic forces and the South Korean agency all enter the fray, leading to a violent showdown. With The Berlin File, director Ryoo has eschewed the reverential martial arts fare of his prior films in favor of the brutal espionage style exhibited within The Bourne Supremacy/Ultimatum, and emerged all the stronger for it. Indeed, the director has adopted many of the features of Paul Greengrass’ spy classics by utilising a moving camera and rapid editing during the lighting-quick action sequences, producing some of best work of his career and representing a true evolution in his abilities. In addition to the exhilarating action and stunt work, the danger of the spy world is wonderfully conveyed. The various betrayals and secret dealings between the disparate agencies produce an intense atmosphere of uncertainty and distrust that continually keeps the audience guessing, harnessing the paranoia of the Cold War era in a contemporary context. By tapping into the fear of the transitioning North Korean government, the story achieves potency as the war for information and power takes on an all-too-real aspect that serves to heighten tension further. Similarly the choice of Berlin is a masterstroke given its history, and director Ryoo films the city as if it were a character itself. The distinctly European style coffee shops and restaurants, the lively streets and the shadowy alleyways all converge to portray the German capital as a hub of culture and intrigue, and one where danger lies at every turn. Placing a North Korean agent as the ‘hero’ of The Berlin File is also an enthralling decision, representing a genuine shift in the relevance of protagonists from the country. Just as Shiri (쉬리) opened up a wave of storytelling regarding ‘brotherhood’ between the two nations, The Berlin File takes it a step further by emphasizing Jong-seong as more active than his South Korean counterpart Jin-soo, despite the corruption that blights them both. As the top spy of the communist country, Ha Jeong-woo gives a great performance and is highly convincing as the cold, detached secret agent. His lines in English and German are delivered with confidence and assuredness and are quite impressive throughout, while his composure during action sequences mark him out as a genuine action star. Ryoo Seung-beom also handles himself particularly well as ruthless agent Dong Myeong-soo, conveying an unsettling villainy with cocky self-assurance that serves as a great counterpoint to Jong-seong’s naivety. It is acutely fitting that Shiri star Han Seok-Kyu features within the film as older South Korean agent Jin-soo, almost forming as an angrier, more frustrated extension of the prior character. While he occasionally stumbles when performing in English the actor conveys the bitter frustration of his situation convincingly. Unfortunately, out of all the protagonists it’s Jeon Ji-hyeon who is short-changed as translator Jeong-hee. The actress performs the role with skill, however it simply isn’t developed enough for her to display her talent, and as such she functions as little more than a damsel in distress. 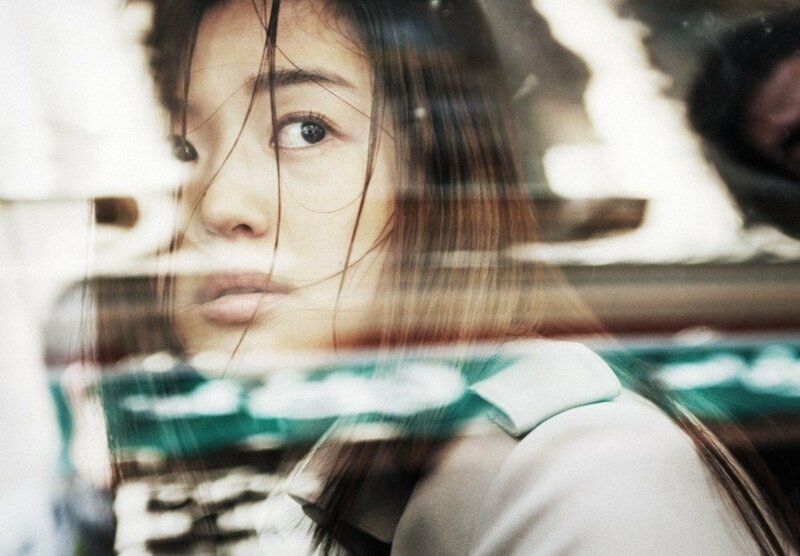 The issues with Jeon Ji-hyeon’s underdeveloped role highlights the main, and rather large, issue within The Berlin File. There are just far too many characters within the narrative, each containing their own history and motivations for taking part in the proceedings, enacting scores of double-crosses with those around them to achieve their goals. Director Ryoo ambitiously attempts to give service to every faction and individual, yet in doing so he loses focus on the core protagonists and as a result their development suffers. The array of narrative tangents also bogs down the main impetus of Jong-seong’s mission which a great deal of time and effort was spent constructing, while the variety of betrayals and red herrings that occur make the plot a confusing, and somewhat frustrating, viewing experience. Perhaps for this reason director Ryoo seems unsure how to finish his spy thriller, and as a result the finale boils down to something of a stereotypical stand-off seen in generic action films. To the directors credit, the final act is indeed exciting as gunfire hails from all directions while physical confrontations feature some vicious, wince-inducing moments. Yet despite the exhilarating fun of watching the good and bad guys duke it out in the high stakes battle, it’s difficult not to feel that it is mismatched with what came before, and that a less convoluted plot would have ultimately led to a more rewarding finale. The Berlin File represents a stylistic evolution for director Ryoo Seung-wan, featuring some of the best action and stunt sequences in recent memory and arguably the best of his career. The director captures the paranoia of the spy world with confidence and skill, employing the city of Berlin incredibly well as the location of espionage. While the over-abundance of characters and narrative tangents bog down Jong-seong’s mission, director Ryoo deserves credit for going beyond the themes of ‘brotherhood’ by actually placing a North Korean agent as the ‘hero’ of the film, making The Berlin File an exhilarating, if somewhat convoluted, spy thriller.